Cloverfield and Assorted Bizniss - "So what's your strategy?" As far as assorted business goes, I have two finals on Friday. Both English. Which means my hand will meet an unfortunate and untimely end, and then I will probably resurrect it to write a lengthy LJ entry about how awful it was rather than studying for the final I have on Saturday. Just giving you a heads-up. Also, my family will come on Sunday to take away some of my crap and additionally to use up some of my ridiculously large amount of surplus meal points. It will be joyous. Today marks a full week and a half that I have been listening to absolutely nothing but My Chemical Romance. This is slightly disturbing. 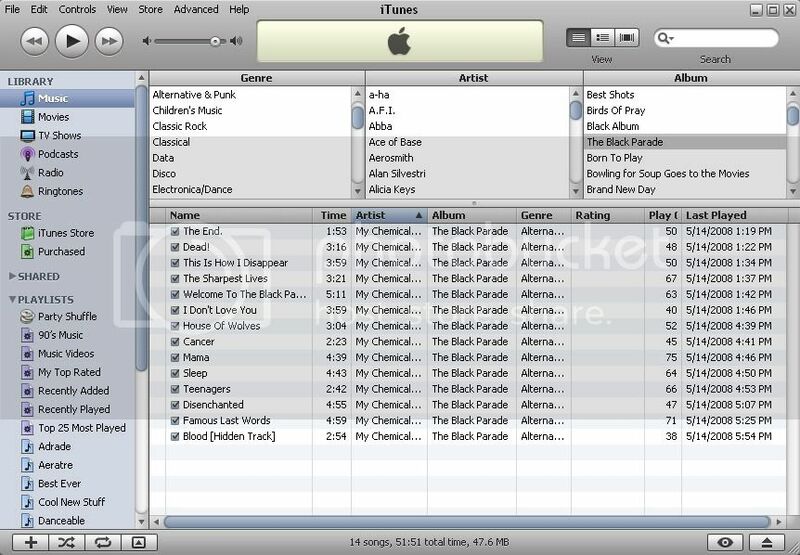 iTunes looks like this. And that doesn't count a couple more playcounts that are on my iPod right now. I'm actually starting to go to YouTube with some frequency for a couple songs from their previous album, which is probably a good thing, since my mommy just bought it for me the other day because there was a CD sale at Borders and I begged her to make use of it on my behalf. I always intend just to listen to the songs and do other stuff, then I end up watching the music videos from start to finish. All three of them are amazing in strikingly different ways. In a perfect world, they would be full-length movies. In other news, I saw "Cloverfield" for the conclusion of my Ancient Monsters seminar this afternoon. I'm still confused about what the title is supposed to mean. Wikipedia said something about it being the name the government would give to the case or something. Anyway, no spoilers, blah blah blah. Sooooo... first off, the monster is dumb. I'm sorry; it's just true. Unfortunately, I knew that the monster was dumb before I started watching, ergo I was sitting there waiting for the dumb monster and thinking to myself, "Gee, this monster is dumb." Which is not how you should go into a perfectly decent movie. THERE, I SAID IT. Perfectly decent. I was expecting it to be utterly abysmal, because a lot of people told me it sucked, but it really wasn't. A great deal of it was very well-executed, and there were a few scenes that were genuinely scary. The special effects are phenomenal, of course, but the part that pleasantly surprised me was the characterizations. Because they were, like, good. You didn't get too long to get to know the poor fools before they started running around in the frying pan, but I found myself caring about them a lot. Even when they did stupid stuff, as they occasionally did, though there was nothing of Let's-Go-Into-the-Basement caliber, which was nice. The acting was surprisingly adequate, too. I was consistently impressed by these nobody actors' abilities to make it seem like they were doing a whole lot more than screaming and fleeing a computer-animated behemoth that they couldn't even see. Not bad at all. A very strong cautionary word, however -- I used to get carsick a lot, and though I really don't anymore, this movie made me extremely ill. Now, there are other variables to consider, including the fact that I might have been dehydrated (though I started guzzling water and saw no noticeable improvement) and the fact that all I'd had to eat was a piece of pizza and some Sprite just as the movie started, but it was bad. They're going for the whole 'cinema verite' thing with the hand-held camera and whatnot (an impressive hand-held camera, I might add -- not only is there a light on it, it also has a night-vision feature and weathers implausible amounts of damage! ), and they're pretty nice about it when it comes to things like the camera-wielding guy running (of which all characters do a great deal), but... eughhh. Watch out for that. I actually had to leave the room halfway through, knowing that the bathroom was across the building and down the stairs and not wanting to run the risk of having to upchuck in the trashcan in front of my seminar buddies. Water on the face helped. The face in question was paper-white, and the omnipresent circles under my eyes looked violet. Hmm, not so interested in the needless destruction, I'm afraid. That sounds a little like my experience watching Castaway in the front row at the theater when the plane was going down. It didn't really make my nauseous, but it came close. Funny, though. My English classes don't usually have finals. We get assigned papers to turn in, and then class is cancelled on the actual finals day. I am so glad school has been over for me for a week! Good luck on your finals! I'm more of the romance movie or angsty type of movie without destruction and stuff.lol.